TW Chat Room > Categories > F.W.I.W. Department > Climax Indicators: Tech Sector Selling Losing Steam? With next week being OPEX along with Hurst cycles and the McClellans' timing model suggesting price bottoming next week, the following observations may be premature, but climax indicators (CLX, CLXpp) appear to be sending some positive tones concerning tech stocks. The CLX and CLXpp tools measure short term volume breakouts and breakdowns of an index's components and often telegraph index price changes in advance. The NDX component AYDIS (CLX minus CLXpp) MACD indicator is exhibiting weaker downside momentum as the NDX price drifts lower. Since the NDX has not yet broken its early May lows, a clean positive divergence in not yet in place, thus continued price pressure on NDX may stick be in the near term cards. However, despite Wednesday's nearly 1% decline in the weighted NDX, the NDX component CLX and CLXpp postings showed a surprising resistance to collapsing. In addition, the NDX unweighted index continues to exhibit superior relative strength with respect to the weighted NDX, suggesting several NDX components may have already bottomed. The straight NDX AYDIS 3 day MA is also exhibiting a rising bottoms pattern as the NDX price is contained in a declining flag. Even the SMH CLX-CLXpp indicators are suggesting selling momentum may is weakening in the "blue chip" semi-conductors. Although the SMH broke its $37 closing support Wednesday, the SMH AYDIS MACD indicator is trying to remain above its short term support. There is also evidence traders are disgusted with tech stocks (at least the long side traders) and are not paying much attention to them of late. The below indicator is a composite of five tech related Rydex sector funds, whose assets are adjusted for fund price changes, then summed up. In early March, this indicator shot higher indicating the Rydex tech sector traders were positioning themselves for a tech price rally following the NDX sell-off from its mid-January high. In another words, the Rydex tech traders were bottom fishing, and it was noted at the time the likelihood of an appreciable tech price rally beginning in the the first half of March was unlikely until this indicator exhibited less enthusiasm for tech funds. It's taken a couple months, but the mood may be getting ripe for supporting higher tech prices from a sentiment perspective. This indicator recently reached levels below the October 2005 bottom suggesting the Rydex traders have lost interest in tech funds, and are looking elsewhere for opportunities. Note the NDX is actually higher now in price than in early March when the Rydex tech fund traders were all bulled up for a strong price up move. The ultimate price bottom may be yet ahead for the tech stocks, but evidence is mounting that this sector may be getting sold out both from money flow and sentiment perspectives. Hi Randy. How about an up date when you can find the time after today's fiasco in the ndx and semis. Thanks. I always look forward to your insights. 1) NDX CLX was -45, CLXpp was -33. Neither of these are historical extremes in the 9 years of data I have. In addition, all positive divergences with the climax indicator data are still in place, including the McClellan indicators which are not posted. However, I feel we will see the obvious price support levels in the NDX and Q4s tested, and likely broken before an IT bottom is in place. 2) The SMH CLX was -15 and CLXpp was -10 on Thursday, which is reaching the washout zone (CLX) since the SMH has only 20 components. Price-wise, the SMH may be more vulnerable than the broader based tech sector due the ridiculous weighting of the SMH index. However, so far its CLX-CLXpp derivative indicators are still in positive divergence with the AYDIS mid-April low. 3) After checking out the Rydex asset flows from Thursday, the NAV adjusted flows did not suggest the Rydex bears were jumping on this decline. There were moderate shifts from the bull funds, but certainly no panic, likely another sign more is needed on the downside. As far as the tech Rydex funds, minor signs of bottoming fishing... not the activity we'd expect at an IT bottom. We have several forces in play right now, OPEX, Hurst cycle lows scheduled for next week, and Tom McClellan's excellent work with a 1986 price analog along with his timing models not expecting a bottom until late next week at the earliest. Yesterday's action suggests these factors will have to be dealt with. What I will be looking at over the next week or so, will be the levels of the AD MCOs in particular. As we all know, yesterday's breadth action was a washout, and may or may not be the internals momentum low for this down move... we'll likely have a better idea following today's action. If the AD MCOs reach the -80 to -100 levels, depending upon the index, we have likely entered a consolidation frame over the next few months which will culminate in the violation of whatever price lows we see in the near term, about 2 to 4 months from now. My RUT breadth data showed 160 advances and 1791 declines yesterday, with the down to up volume ratios (traditional and $weighted) in the 6 to 1 range. Lopsided breadth ratios like that typically signal momentum lows, but the possibility of another day or two of that type of carnage has happened before and may again in this current correction. Tom McClellan posted the below chart last week in his publications and again earlier this week on another public-type forum and it is an eye-opener, perhaps explaining the problem in small cap breadth and volume over the past few weeks. Tom's chart shows a 14 month lead time of gold prices with inflation. This chart even predicts what range inflation will be at 14 months following a peak in gold, currently at 10%. The 10% inflation rate is not set in stone of course, but the technique has a pretty fair track record. Imagine the impact such an inflation rate would have on interest rates and the fortunes of small companies more sensitive to interest rates. Perhaps the market is beginning to recognize the effects of high oil prices over the past year as its impact ripple through the economy going forward. Back to the near term market, IMHO we likely have more downside work remaining, but when the correction is completed, I look for additional new highs or recovery highs in the various indices. I am not expecting a devastating price crash in the near term (famous last words, there's your fade) defined as over 8% to 10%, most likely less than that magnitude. The internals behavior of the ensuing price rally will provide many clues for determining if the next leg up will lead to a more important price decline in the longer term. I'm currently short the market via Rydex Venture (or whatever its new name is). Don had commented that if the DOW was flat to down leading into Weird Wally Wednesday, da boys would probably rally the market into options expiration or vise versa. The market did indeed rally into last Wednesday, so the play was to position for a downturn, which thankfully has been successful. Here is one of my clx charts. I'm giving the link because I still haven't had the time to figure out how to shrink the chart down and I don't want to waste fibs band space. On the DOW part of the chart, I have boxed from the WWW to the Friday of options expiration week for the last several months. John: Thanks for the Dow CLX/CLXpp value updates. Darris: interesting suggestion with the seasonal scenario, will look into that and report anything of interest. As cheif observed with the Dow CLX 30 day unfavorable offsets now used up, the NDX 30 day CLX offsets have one more (Friday) unfavorable offset (+9) to work off. However, the NDX CLX, CLXpp, and AYDIS (CLX minus CLXpp) indicators have continued to exhibit positive divergences over the past few days despite the price carnage, suggesting that on-balance, the NDX components' individual cumulative volume line variants are not unanimously participating in the price decline this week. The NDX AYDIS MACD and signal line continue to remain above their respective mid-April lows, while price has plummeted. The AYDIS 3-day SMA is diverging as well, both from the mid-April low as well its low posted Monday; since Monday's close, the NDX has fallen nearly 3% while the NDX 3 DMA AYDIS has thus far resisted breaking its Monday low. The 3-day MA divergence with price is also evident in the CLX and CLXpp components (not shown) of the AYDIS. The CLX related divergences, with respect to price, are perhaps hinting a long side position in a NDX tracking vehicle will yield solid returns in the inevitable reflex rally coming soon. Coming from you, the market letter endorsement is very flattering, but since study of the markets is my "part-time" job, I doubt Mrs. Mortiz would allow me quitting my day job to pursue full-time focus on the markets. Anyway, thank you for the kind words, from you, they mean something. My analysis is not always correct, but I do try to conduct due diligence in continuing to learn. I realize people pay you for such analysis, but my original thoughts on the current bounce would be just that, a bounce with a retest of the lows going into Weird Wollie Wednesday (June 7th I think). It would be very interesting and helpful to hear your thoughts on the following setup. The one fact that flies in the face of the "bounce up then down again" scenario is the current string of CLX/CLXp favorable offsets, not only in the Dow, but in the NDX and SMH CLX numbers which I also track. Currently, over the next seven trading days going into WWW, the 10-day CLX offsets are favorable for the Dow, NDX, and SMH. The 30 day CLX offsets are more of a mixed bag , with the next 7 or 8 trading days having three unfavorable offsets for the NDX and SMH, while the Dow has five unfavorable 30-day CLX offsets over the next 7 or 8 trading days. Currently, the CLX 10-day MA is under the the 30 day MA for all three of the indices, while the CLXp 10 day MA is above the 30 day MA in the Dow and SMH.... the NDX CLXp 10 day is still below its 30 day MA. In the few months of my CLX studies (still an admitted greenhorn with these fascinating tools), I have seen all three of these indices "squander" favorable-for-the-bullish-case CLX offsets, i.e. a good rally did not get underway when the opportunity was in place. Considering the CLX conditions described above, the importance of WWW, and the widespread expectations of this current bounce failing (which is good for the bull case of course), could you provide any hints of what a CLX student should be focusing on at this juncture? Thanks in advance for any hints or guidance from the master of the CLX tools. FWIW, here is how I've recently played the market using the clx. 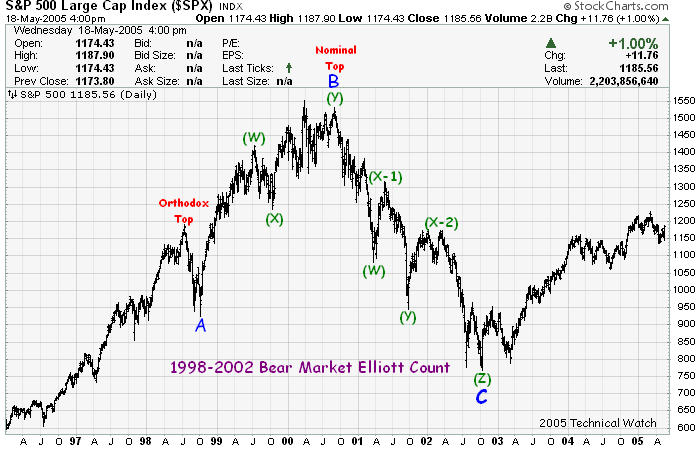 Going into this last WWW, the market had been in an obvious uptrend. On one of the charts that I recently posted, you can see that if the market is in an uptrend going into WWW, it's not uncommon for a down market thru options expiration week (and vice versa). While I had planned on shorting the close on that Wednesday, a very busy day and long hours at work didn't allow this to happen. So on Thursday morning, I shorted via the Rydex Inverse Dynamic OTC. I exited this position at the close on May 22 (the decline appeared to be slowing via other indicators, divergences between the 3d clx vs. 3dpp, and that ever demanding work schedule keeping me from closely watching the market). I went long Rydex dynamic OTC on May 25th, the day that began a string of strongly positive 10d offsets coming into play. BUT, I am only at a 50% position because of the 10d ma's under the 30d, as you mentioned above. As of today, the 10d pp is now above the 30d, yet the 10d clx is still below its 30d. If and when the clx crossover occurs, I anticipate going 100% invested into the dynamic OTC. This is how I tend to play utilizing the clx. But as you know, Don doesn't invest using only the clx. But the clx definately helps to clear the muddied waters that Mrs. Market loves to challenge us with. Randy, have a peaceful and relaxing Memorial Day. And Don, when you read this, here's hoping that your health is on the uptrend. There are those that accuse you of decreased posting when the market is in a down trend. I've noticed that there has also been decreased posting during many parts on the uptrends also. I suspect the truth is more that you are having issues with your BP and other health issues and now this potential inner ear situation. Please take care of yourself, my friend. Cyberspace is just not the same when you can't come out to play. Despite your busy work schedule (know where you're coming from, I'm in the 55+ hour week routine myself these days), thanks for laying out the CLX roadmap as you see it. Since I am still a green novice in the use of these tools, I am still in the process of getting a grip on how best to interpret them, and like any indicator, use the CLX in conjunction with other tools that have worked for me in the past. I appreciate your taking the time to weigh in and look forward to your posting of CLX charts again when life settles a bit. I had time to peruse some other sites last night and saw where cheif is battling health issues, I pray he gets these problems solved, cheif is a valuable resource. His experience and wisdom in sorting out the market puzzle is invaluable and I for one appreciate his willingness to share his thoughts on public forums. Have a restful remaining holiday John. I'm going to post the CLX spreadsheets in a fresh thread, and if time allows, could you comment on my Dow numbers to ensure they match up with the "official" data? Similar irregular flat count presented here as a reference, although Don's orthodox and nominal tops are a bit different.